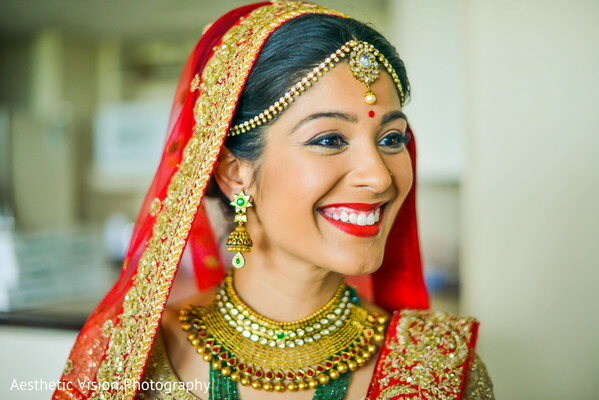 Today’s Indian wedding celebration is chock-full of Indian wedding ideas and we cannot wait to share all the lovely details of Pooja and Sachin’s gorgeous outdoor wedding event out of one of our favorite cities in New Jersey. 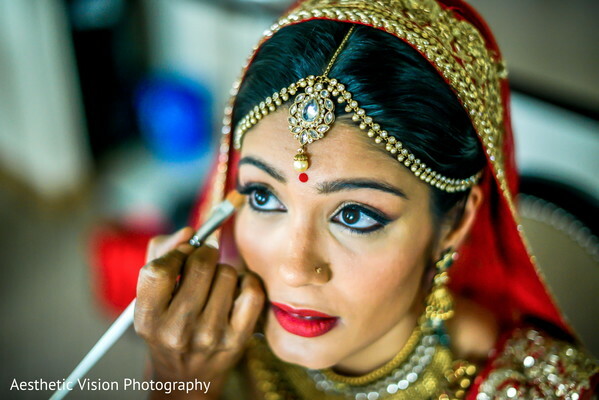 Style by Susmita polished this bride to perfection for her big day! 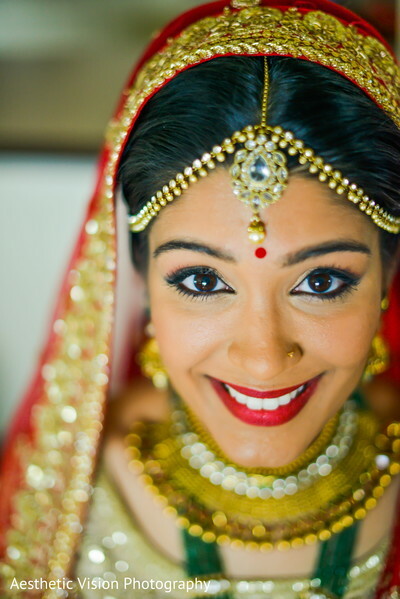 Maharani Pooja made one gorgeous bride. 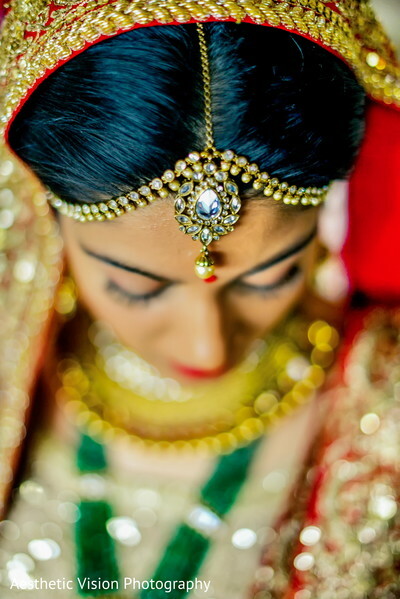 Bold red lips, Midas inspired dusted bridal jewelry, and a sweeping gold and red lengha that glittered with elegance, definitely took center stage. I love the incorporation of a jade green necklace that stood as a complimentary side accessory. The bride and groom opted for a private first look in the gorgeous garden areas of the Sheraton Mahwah before the Indian wedding ceremony was to begin. The look on Sachin’s face as he takes in his bride is priceless! Planning and design was spearheaded by none other than Bells N Rings Events who ensured that all the events were streamlined seamlessly at the Sheraton Mahwah. 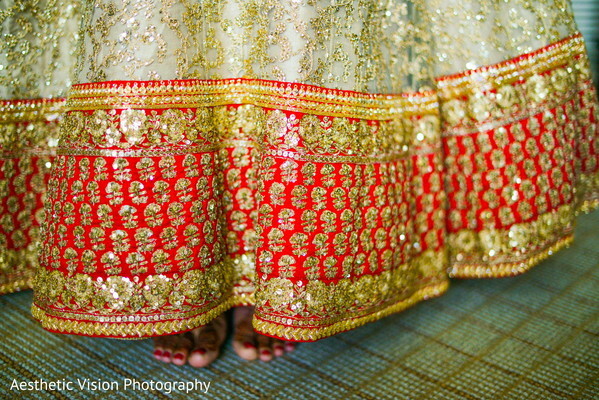 We have a lot more pics awaiting in the gallery shot and organized by Aesthetic Vision. You will want to make sure that you return as premier decorators Elegant Affairs Inc. presents an awe inspiring mandap and DJ Monu Singh curates the perfect lyrical playlist for the wedding ceremony. See you right back! Elegant Affairs Inc., Bells N Rings Events, DJ RAJ Entertainment & Event Lighting, DJ Monu Singh Entertainment and Newark Liberty International Airport Marriott are members of the Platinum Guide. Love what you see? Explore their portfolios.